- New professional interface using standard windows controls. - Expanded file format support including MP3 reading! - Backup/Restore all your settings to a single file. - Better list management for all your voices and sound effects. - Plug-In support, allow for more features now and in the future. - Multiple-user support, easily switch between different speakers. Click on the links below to listen to MorphVOX Pro superior voice changing quality. MorphVOX Pro voice changing software can be used with all online games including World of Warcraft, EVE Online, Second Life, Lord of the Rings Online, Everquest, Counter-Strike, Battlefield 2 and many more. It also integrates with VoIP and Instant Messaging programs such as Skype, Ventrilo, TeamSpeak, Yahoo Messenger, MSN Messenger, AIM, XFire, GoogleTalk, Roger Wilco and more. 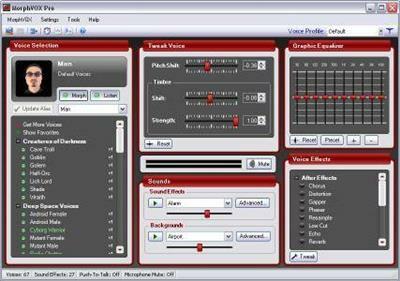 In the studio, MorphVOX Pro integrates with multimedia applications such as Sound Forge, Vegas, ACID, Audacity, IClone and much more. - Audio Alarms: announce the time or play a clip.